Ring, ring, ring, ring, ring, RING. Demi sighed and pulled her acking body off of the sofa, where she had been asleep. Kesha also staggered out of bed, heading towards the stairs. "DEMI, DOORBELL!" She yelled loudly. "You&apos;re the adult, you get it! I&apos;m still sleepy!" "It&apos;s your house," Demi retorted as she stumbled towards the door. When she opened it she got the shock of her life! "Demetria," two voices said sternly. "Aunty Meggie! Uncle Sammy?" Demi said in shock. "But you&apos;re not due back for two weeks yet!" "The trip got cut short," Sam answered bluntly. "We forgot our keys." "Yes, out of our way Demetria." Meg snapped. Demi quickly stepped out of the way, letting her Aunt and Uncle go past. "Where is Kesandra?" Meg asked sharply. Demi&apos;s head snapped around to look where Kesha had just been standing. "In bed," she quickly said. Meg gave a nod of approval. "We are going off to bed. We expect you gone in the morning Demetria, we are no longer in need of you assistance. Don&apos;t worry, you will get your money," she added. Demi stood there in shock as she watched them go upstairs. She had forgotten how awful they were. She decided to go upstairs too, walking towards her own room. Suddenly she stopped, hearing soft sobbing coming from Kesha&apos;s room. Demi pushes open the door and poked her head in. The sight that met her broke her heart. Kesha was curled up in bed, sobbing her heart out. She lifted her head weakly when she heard the door open. "Hey," Demi cried worriedly. She rushed to Kesha&apos;s side. "Baby girl, what&apos;s wrong?" She slipped easily under the covers, pulling her into a hug. 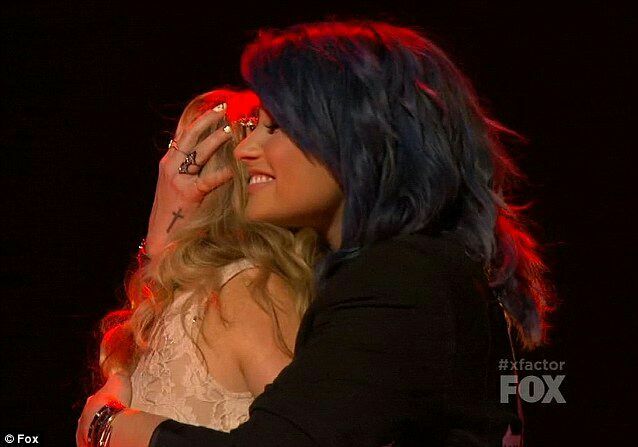 Kesha didn&apos;t answer and simply hid her face in Demi&apos;s top. "Please talk to me Kesha, I&apos;m right here..." She soothed softly. "I&apos;m sorry I was mean. I&apos;m sorry I wasn&apos;t good. I&apos;m really, really sorry Demi! Just please, please, please don&apos;t tell my parents I wasn&apos;t good. Please Demi, I&apos;ll go anything!" Kesha sobbed. "What makes you think I was going to tell them any of that?" Demi asked. "I wasn&apos;t going to, I promise!" "Yes, really." Demi confirmed and began to stroke her hair. "A-and y-you won&apos;t tell them a-about w-w-what a freak I am?" She sobbed harder now. "Well, the deal was that you would try and improve.... You haven&apos;t really done that, have you?" Demi sighed, not knowing what to do. "Demi, you can&apos;t! They will kill me! They will disown me!" Kesha sobbed, becoming hysterical. "No they won&apos;t, baby girl. They will help you! They love you!" Demi said sternly. "What do you know," Kesha whispered darkly. Demi didn&apos;t bother to answer, there was on point. She didn&apos;t want to upset Kesha any more than she already was. As long as Kesha was with her, she was safe from hurting herself.